Have you ever heard of a progressive dinner party? I hadn’t until last year. Apparently, it was big in the ’70s. The basic idea is that a group of people eat dinner together, with each course being at a different house, meaning each house prepares only one course of the meal. Last October, some of my friends and I thought it would be fun to do. We all live within about a two mile radius, so the logistics worked in our favor. We switched up the rules a bit and sort of did an “Around the World” theme, with each house preparing a few small dishes from a country and pairing it with a drink. Food: Toasted ravioli, caprese salad, and traditional lemon cookies (anginetti). Food: Proscuitto-wrapped apples, goat cheese dip, and paella. Food: Chocolate crepes with nutella, strawberries, bananas, and powdered sugar. Of course, I have no pictures. Boo. We learned a lot from our progressive dinner. First of all, we had way too much food. By the time we got to the last house, I was way past full. We knew we needed to prepare less food the next time around. Second, we really liked the food-drink pairing and thought that worked well. We’ll keep that. It also worked well the pattern of houses we used, starting with the west-most house (ours), and heading east the whole night. We’ll do that again for sure. Fast forward to last weekend, and we had yet another successful progressive dinner. We were looser with the themes this time, and everybody just sort of picked what they wanted to make on their own, without having an overarching theme for the night. We again started at our house. 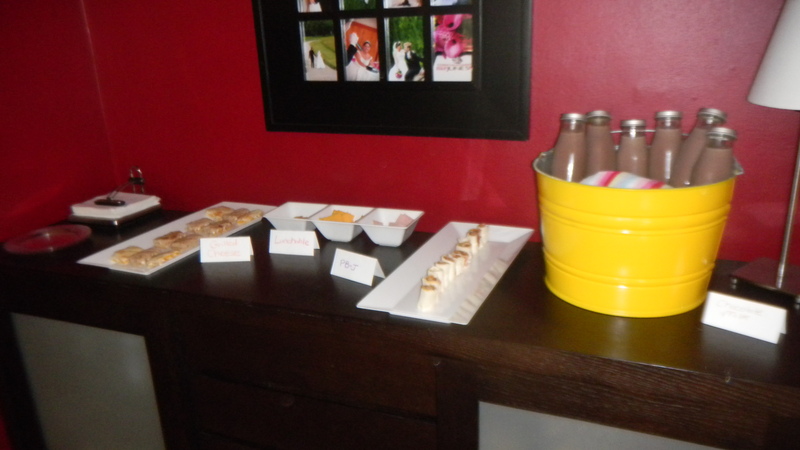 Our little mini theme was “When We Were Kids.” We made upscale, adult versions of food and a drink that we loved as kids. On the menu: mini grilled cheese sandwiches made with goat and colby cheeses, Lunchables (made with Wheat Thins, oven roasted turkey, and sharp cheddar cheese), and mini natural peanut butter and sangria jelly rolls (tastes like PB&J, looks like Maki). 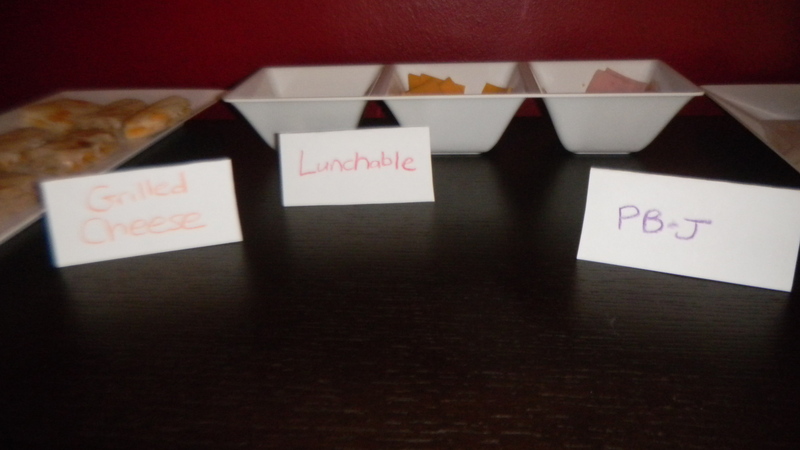 We labeled each item with a crayon-written sign. 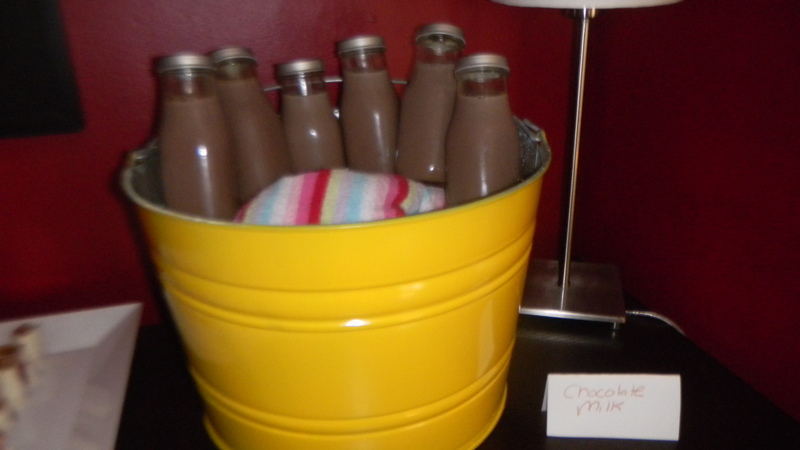 And I used my big tub to display the milk bottles. I got many complements on how well the bottles worked. The secret? They are Starbucks Frappuchino individual serving bottles that I kept, knowing I would need them for some party or craft down the road. The only change we made were the bottle caps. Dan sprayed those babies silver. The next house featured some great food – sangria, goat cheese dip (you can never have too much goat cheese in one night), and this wonderful crab mixture in an avocado. Yum! House #3 had a sort of Mexican theme going on. We had churros y chocolate made for us from scratch! I had emailed her this recipe from Joy the Baker, which she used in making them. Apparently, it’s a good tutorial with pictures for the steps along the way. Even though we missed House #4 (Dan had to fly to NYC), I’m sure it was delicious. Homemade cherry pie with, get this, homemade red wine! Yep, Colleen has been wine making with her uncle, and the day of the progressive dinner was the day the wine was bottled. I’ll have to make sure to ask her to taste some at her next event. I hope we can have one more progressive dinner this year, before it gets too cold and no one wants to go from house to house anymore. Thanks for the fun time, friends!